Josh Paler Lin had no idea his little experiment would end up the way it did. As the World Journal reports, Lin gave $100 to a homeless man named Thomas near Anaheim and then followed him with a video camera to see what he would do with it. To Lin’s surprise, Thomas bought food and shared it with other homeless people, many whom he didn’t even know. Lin asked him why he did it. Thomas told him it brought him happiness. Lin who calls himself the “craziest Asian prankster alive” has started an Indiegogo campaign for Thomas and has raised $139,000 as of this writing. Lin hopes to surprise Thomas with enough money for him to buy a home. 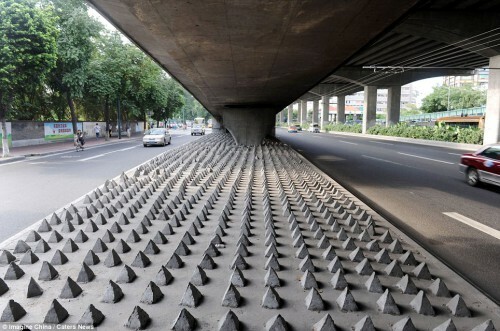 With the rising number of homeless people finding their way into the urban areas of China, the government has provided a solution for chasing them out. 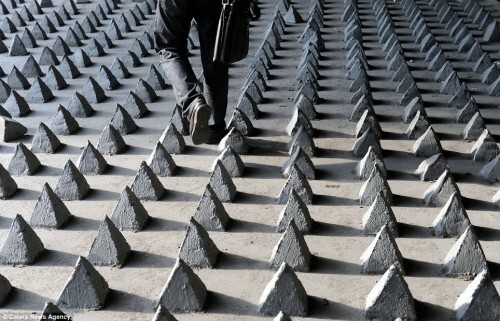 The PRC government recently decided to put up concrete spikes, measuring 20 cm in height each, under the city bridges to prevent people from squatting in these public areas. Two homeless men eating a meal outside shuttered shops at night in the western Japanese metropolis of Osaka. Homeless men are being recruited for one of the most unwanted jobs in the industrialized world – clearing of radioactive fallout at the world’s worst nuclear disaster since Chernobyl – the crippled Fukushima nuclear plant, a special report has claimed. One of the recruiters, Seiji Sasa, told Reuters how and where he is looking for potential laborers in the northern Japanese city of Sendai. The headhunter supplies homeless people to contractors in the nuclear disaster zone for a reward of $100 per head. “This is how labor recruiters like me come in every day,” Sasa explained, walking past the destitute sleeping on cardboard in the winter cold, on the lookout for those who have nothing left to lose. 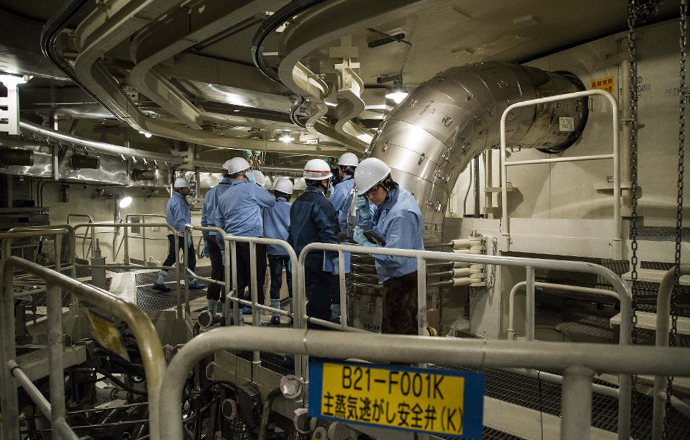 Meanwhile, it is said the complete decontamination of the facility will take three decades and could cost up to 10 trillion yen ($125 billion) – equal to around 2 percent of Japan’s gross domestic product or 11 percent of the country’s annual budget. According to the Fukushima plant operator, Tokyo Electric Power Co (Tepco), dismantling the Fukushima Daiichi plant will require at least 12,000 workers just through 2015. The company and its subcontractors are already short of workers, however. A reactor vessel at the unit six reactor building of Tokyo Electric Power Co. While there are currently some 8,000 registered workers, there are 25 percent more openings for jobs at the Fukushima plant than applicants, according to government data. These gaps are often filled by the homeless and the unemployed, those who are down-and-out. It was reported last month that among the homeless men employed cleaning up the stricken nuclear plant for less than minimum wage, there were also those brought in by Japan’s notorious Yakuza gangsters. RT’s Aleksey Yaroshevsky caught up with an investigative journalist who went undercover at Fukushima, filming with a camera hidden in his watch. He said that when a certain construction project requires an immediate workforce in large numbers, Japanese bosses usually make a phone call to the Yakuza. “This was the case with Fukushima: the government called Tepco to take urgent action, Tepco relayed it to their subcontractors and they, eventually, as they had a shortage of available workers, called the Yakuza for help,” Tomohiko Suzuki told RT in November. Japanese police say that up to 50 Yakuza gangs with 1,050 members currently operate in Fukushima prefecture. Earlier this year, the first arrests were made. One Yakuza was detained over claims he sent workers to the crippled Fukushima plant without a license. Yoshinori Arai took a cut of the workers’ wages, pocketing $60,000 in over two years. It also emerged that many of the cleanup workers, who exposed themselves to large doses of radiation without even knowing it, were given no insurance for health risks, no radiation meters even. The devastating March 2011 earthquake and tsunami, which claimed nearly 19,000 lives and made tens of thousands of people homeless, set off multiple meltdowns at the Fukushima plant, spewing radiation over a large area. The radius of evacuation after the meltdown is larger than the area of Hong Kong. Some areas will remain contaminated for years to come, nuclear experts forecast. All of Japan’s nuclear reactors are currently switched off. However, a recent opinion poll conducted by NHK of Japan, has found that nearly half of those taking part in it are against the Nuclear Regulation Authority’s plan to allow the restart of shut down nuclear reactors after safety checks. Only 19 percent of respondents approved of the plan, while 45 percent said they were against it. Another question asked if respondents were satisfied with the handling of the leaks of radioactive wastewater from the Daiichi nuclear complex. Nearly 70 percent said they disapproved. Major setbacks have stalled TEPCO‘s handling of the nuclear disaster amid widespread criticism and calls to put Fukushima-related work under government control. 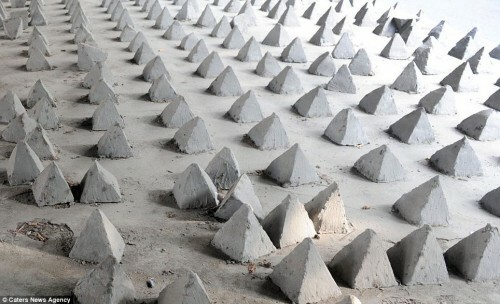 Earlier this month Japan said it will earmark more taxpayer money to help Tepco clean up the crippled nuclear plant. The government’s extra budget new draft, for the fiscal year to next March, allocates nearly $480 million for measures to deal with growing amounts of radioactive water at the plant, as well as the decommissioning of its three melted reactors. Additional cleanup projects are expected to be funded through a national public works budget.